This simple recipe uses gelatin to set it rather than cooking. You don’t want to cook all those good buggies in your kefir (or yogurt). I love when tasty meets healthy. Dissolve gelatin in 1/4 cup cold water for about 5 mins. Add 1/4 cup hot water and stir to dissolve. In a stand mixer with a paddle, mix kefir until smooth. Add sugar, lemon juice, cream, pumpkin, spices and salt. Whip for about 2 mins on medium speed. Mix in gelatin until well blended. Mix sugar into flour. Mix butter until well blended. Press into a deep pie plate. 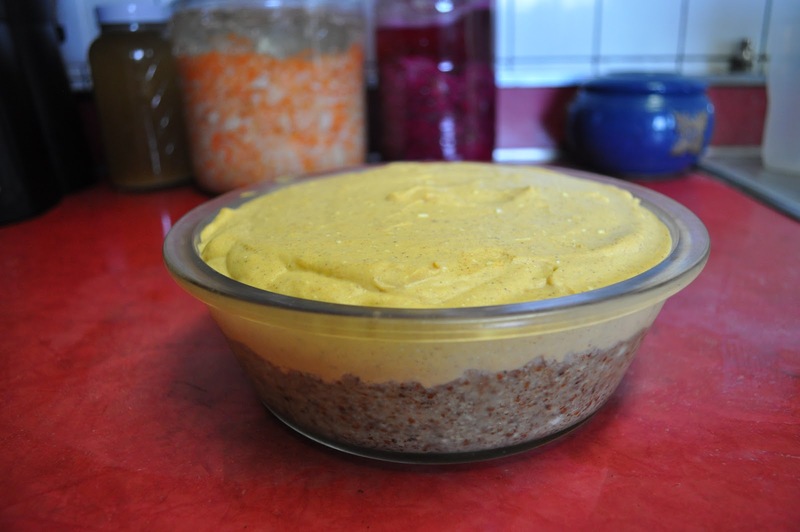 Pour cheesecake mixture into the nut crust and chill overnight. Hi Melanie, this looks tasty! I love the idea of adding lemon. Debbie, I almost left out the lemon but I love lemon so much I kept it. I'm glad I did!Wordsandcoconuts, I'm glad you found me 🙂 As a homeschooling mom of 4 boys, I crave simplicity! Hi! Thank you for this great recipe!! I made it today and froze it for thanksgiving. Hope it doesn’t kill the good bacteria…. Very tasty though! 🙂 made mine with coconut kefir, pumpkin and coconut aren’t really complimentary. But it still tastes yummy! Thanks again!